St Columba Episcopal Church and grave yard, Drumlang, Gruline, are situated on the B8035 on the left hand side of the road along the south shore of Loch na Keal just west of the junction with the B8073. 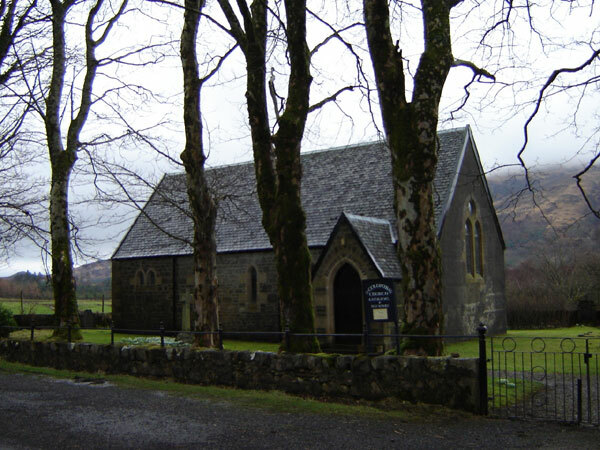 In 1864/6 the first Episcopal services were held on Mull, although, in 1862 the Rev. Rawlinson, an Episcopal minister from Moidart, visited Mull to consider the possibility of monthly meetings. The first service was held in the Industrial Female School in Salen by the minister from Strontian and Kinlochmoidart, the Rev. Hugh McColl. Services were then held in Glenforsa House (now called Gruline House), Kilfinichen (where Presbyterians and Roman Catholics also attended), Glengorm, Drumlang, Killiemore and Killiechronan. In June 1873, through the efforts of General Greenhill Gardyne, a church was built in Gruline as a focus for Episcopalian worship on Mull. He was helped by Captain Parr of Killiechronan and together they bore the cost of the building. The church is dedicated to St Columba and, although completed in December of the same year, it was not until June 1874 that the first service took place. Twenty-six people were present at the morning service, which was in English, and 47 for the evening service held in Gaelic. Finally, on 4th July 1875, the church was consecrated by Bishop George Richard Mackarness – it was the first church on Mull to be consecrated for several centuries. It has never had a permanent minister living on the island and, for many years now, services have been led by a summer locum chaplaincy system and in the winter by Lay Leaders. The church is in the simple ‘gothic revival’ style, built of whinstone with cream sandstone dressing and the gables cement coated. The roof has been re-tiled and a toilet/store room built to the west of the sacristy, which in turn has accommodated refurbishment. 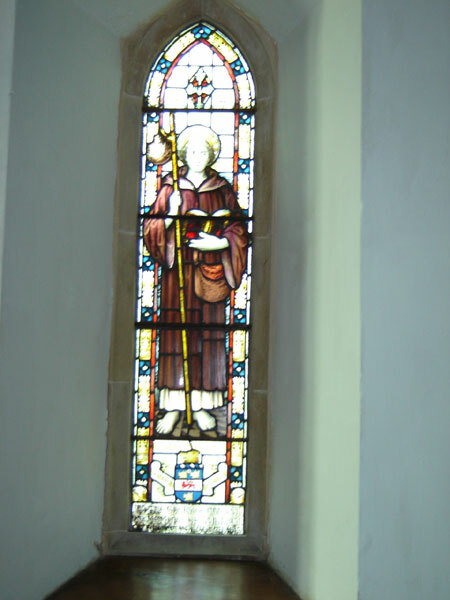 There are several stained glass windows in memory of various people. One shows St Columba and at the west end is one of Mary and Joseph. 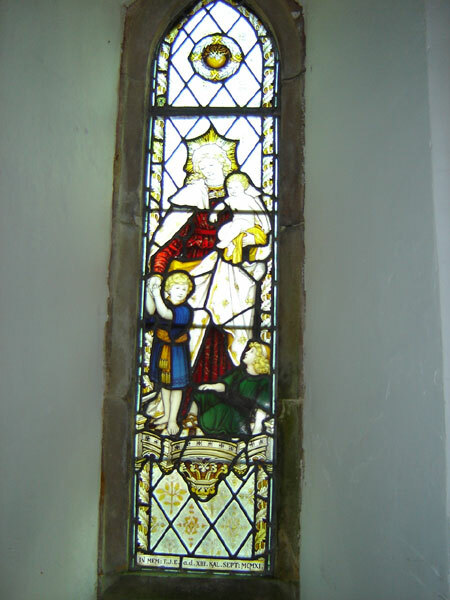 Towards the rear of the church on the north side is a window by Charles Kempe depicting ‘Charity with two children’. Underneath the window is a plaque ‘in memory of Frederic Jameson Elles who drowned in Loch Frisa on 20 August 1911 at 12 years old’. His likeness is shown in the young boy who is standing at his mother’s knee. It is said to be one of the best examples of Kempe’s work. One of the most interesting features of the church, at the east end, is the wooden lectern, which was given in memory of Gordon Frank Melles, who was killed in the 1st World War at the age of 30. 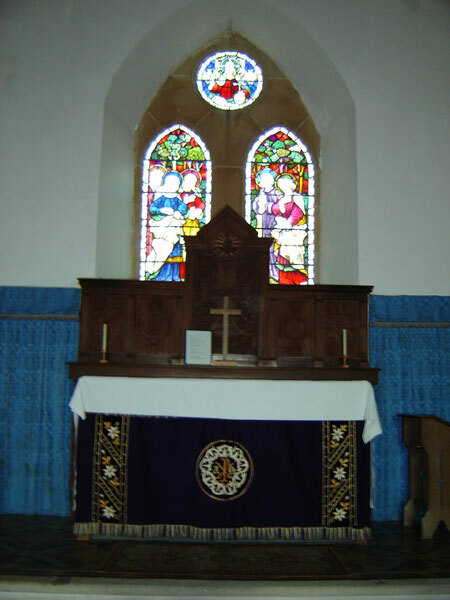 The pulpit, also of wood, was made by Simpson from Kendal, Westmorland, but the carving of a design of crossed flag standards was done by Gordon’s mother, Mary Melles of Gruline. The stone font is at the west end. Inside the church and in the grave yard are many memorials, mainly to Episcopalian members, Mull landed gentry and those of officer class who were ‘killed in action’. The church is open all the time and services are held on Sundays at 11 am and often mid-week. There are information leaflets inside the church.